When mobile phones became essential gear rather than luxury items, a funny (yet predictable) thing happened: Watches started making their way toward obsolescence. After all, who needed them when everyone had a timekeeping device in their pocket or purse at all times anyway? And so watches became redundant, and then became passé. Now however, if you believe a recent New York Times article, there seems to be a return to these analog vestiges of yesteryear. Author Alex Williams attributes this to a resurgent fascination with mechanical objects. In our digital, touchscreen-happy lives, there’s something comforting and elegant about gear with parts that actually — you know — move. It’s both kind of familiar and foreign at the same time, especially to today’s 20- and 30-somethings, many of whom have never turned a TV knob, rotary-dialed a phone or, yes, worn an analog wristwatch. Yet, at least when it comes to these retro timepieces, they’re becoming a red-hot trend that’s appealing to a range of young adults — from males with an un-ironic affinity for heritage machismo (think straight razors, vinyl records, and plaid shirts), to ambitious young ingénues in Manhattan’s fashion industry. But could there be something more at work than just a random fad? It goes back to something that Emily implied in her article, “Is The Internet Killing Our Memories?” There’s so much that’s great about modern technology, particularly digital consumer innovations, but there’s also a limit to the experience they can deliver. There’s a physicality that’s missing. There’s truly nothing quite like holding a photo in your hands, smelling the faint whiff of cologne still delicately clinging to a time-worn, hand-scrawled love letter, or watching the hands of a watch ticking by the hours, minutes or seconds. What I find interesting is that the least likely people to appreciate analog objects are the ones discovering it now — the digital generation. They consider these fine timepieces as symbols of taste and elegance. And to obtain them, they’re using all the tools they have at their disposal — like websites, mobile apps, social networking, etc — to snag them. People scour places like eBay, Craigslist and even Facebook Marketplace, as well as Gilt and other applications, or buy via brands’ online sites. New school meets old school. What’s not to love about that? I’m reminded of a recent piece of mail — my first Postagram! I’d had a party, during which a friend took a funny photo. On the spot, she launched the app, and then submitted the image (which was turned into a postcard for $0.99), before resuming the festivities. A couple of days later, I got the postcard in the mail, thanking me for an awesome time. Friends have e-mailed, shared, tagged me in and even handed me a USB drive filled with digital snaps from the same night. But it is this postcard that I have tacked on my fridge and randomly has me remembering that party whenever I happen to notice it. 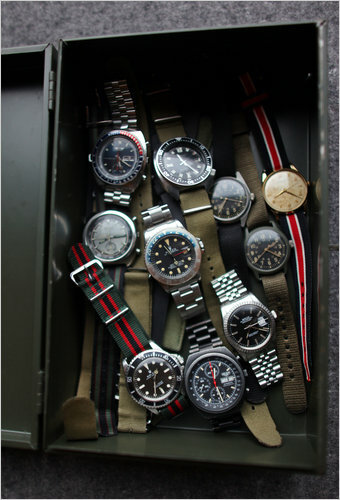 Do you count yourself among the fans of analog watches? What about some other “relic” from the past that digital tech just can’t replace? Or do you think it’s lame to look back to the past, aspiring instead to a fully digital lifestyle? Let us know how you’re living in the comments.